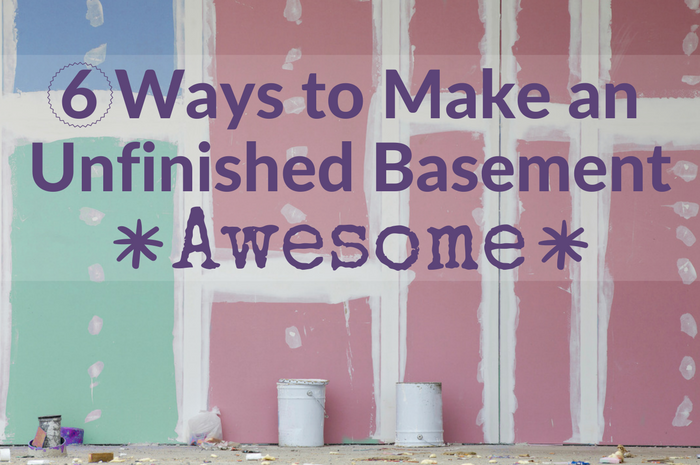 How to Make an Unfinished Basement Awesome! When you think of a cozy room, what comes to mind? Warm lighting? Thick throw blankets? Roaring fire? Stuff like that? Makes sense. Here’s what you probably didn’t visualize: ceiling pipes, excessive moisture and concrete floors. And that, my friend, is why unfinished basements get a bum rap. They frequently suffer from all three issues. But turning a cold basement into a cozy spot isn’t impossible! Even better, it can be done for far less than you’d pay for a full remodel. The biggest anti-cozy factor in most unfinished basements is moisture. Nobody likes that damp, wet sock smell, and you can’t put nice things down there if they’re just going to get wet. That means that before you do anything else, you need to handle the moisture issue. Sometimes this is as simple as purchasing a dehumidifier (about $200) and letting it rip. If your moisture problems are more serious (i.e. leaks or puddles), you’ll need to employ a more aggressive basement waterproofing strategy. Note: A basic waterproofing will run you $200-$500, but if any changes need to be made to your foundation, it can cost $2,000 or more. Now that your basement is moisture-free, you can cozy up that concrete floor. Area rugs are a cost-effective way to do just that. If you happen to have a few unused rugs, put them to good use downstairs (an eclectic look totally works, so don’t be afraid to mix and match). Tip: No extra rugs? No problem. We recommend using Amazon’s handy rug finder to locate a size, pattern and price that works for you. When in doubt, add throw pillows. Even a second-string sofa with feel cozy if it’s covered with soft cushions. We recommend choosing ones that are pretty big for some extra comfort. These 20×20 Isabella Ikat pillows might do the trick, or maybe these 24” Knit Fringed pillows are more your style? Tip: If you like the bohemian look, try arranging on a bunch of throw pillows on your new, awesome rug. Nothing kills the mood faster than a bunch of naked bulbs hanging from the ceiling. Make them irrelevant by adding lamps, string lights or both. You can find a lot of nice floor lamps for less than $50, like this IKEA lamp for $20. It’s going to be hard to make that water heater in the corner look chic, but it’ll be easy to hide that ugly beast. Simply hang up a colorful sheet or even a shower curtain in front of it! If you want to help separate out different areas of your basement in a tasteful fashion, try a room divider. Wine crates, bookshelves and window frames all make good, cheap room dividers. Those pipes, joists and air ducts definitely take away from your cozy basement vibe. But if you paint everything a dark color – like a charcoal gray – you can go a long way towards disguising all the stuff going on up there. Plus, it’s a lot cheaper than covering your ceiling with drywall ($4,000 or more). Note: Doing this yourself is very labor intensive, since a lot of the painting may need to be done by hand. There may also be some special considerations for electrical wiring or heating pipes. Unless you’re an experience painter (or are up for a challenge) we recommend hiring a professional for this. We appreciate our friends at Bright Nest for sharing these great tips with us!